Born in Chiaravalle, Italy in 1870, Maria Montessori moved to Rome with her parents in 1875. Although her father Alessandro embraced traditional views of female education, it was the more liberal approach of her mother Renilde that encouraged Maria Montessori to explore her natural inclination to learn, regardless of the social restrictions placed on women. Through her influence, Renilde played an active role in her daughter's upbringing and the whole philosophy behind what is now known as the "Montessori Method". At the age of thirteen, Maria Montessori attended an all-male technical school. Her studies in math, physics, biology, and medicine led her to apply to the University of Rome La Sapienza Medical School. In 1896, Maria Montessori graduated at the top of her class and became Italy's first female doctor. Throughout, her interest in the development of children grew - she became a member of the University's Psychiatric Clinic and became intrigued with trying to educate the "uneducateable". As she learned from the work of others her own theories evolved, embracing elements, ideas, and methods of all the disciplines she has studied. In 1896, the Italian Minister of Education appointed Dr. Montessori as the Director of the Scuola Ortofrenica, an institution devoted to the care and education of the mentally retarded. Because of her success with these children, Dr. Montessori was asked to start her own school for children. In 1906, Maria Montessori founded the first "Casa dei Bambini" or "Children's House" in one of Rome's worst slum districts for children of the working class. With sixty students in her care, Dr. Montessori focused on teaching children to develop their own skills at a pace they set for themselves. As wide varieties of special equipment of increasing complexity were introduced, Montessori discovered how naturally young children adapted and enjoyed learning everyday tasks. Structure, work, and constructive activity gave the children a sense of self-worth that they had never before experienced. The success of this first school sparked the opening of many more and a worldwide interest in Montessori's methods of education for which we are fortunate to enjoy today! Dr. Maria Montessori encouraged parents to recognize their children were special and of great value. From this reverence for individual beauty and potential grew the Montessori Method. Maria Montessori's observations identified critical periods in early child development particularly the "absorbent mind" time line between the ages of 0-6 years old. During this period, all children in the right environment can master some of the most complex functions, such as speaking or reading, almost effortlessly. It has been through her observations that the Montessori methodology was evolved. It embraces this unique and critical period with a holistic approach to the development of a child's emotional, social, intellectual, and physical maturity. Additionally, Dr. Montessori created her education in such a was as to promote social responsibility in the young. She argued that it is our children who can support long term environmental sustainability and guide the next generation by becoming the peacemakers of the future existing in harmony with all living beings. After a lifetime devoted to the study of child development, Maria Montessori died in 1952. Her success in Italy led to international recognition and her work became widely embraced throughout the world. 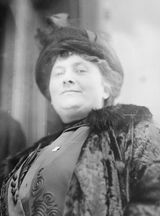 Maria Montessori was nominated three times for the Nobel Peace Prize. Today, Dr. Maria Montessori is still "ahead of her time".